It’s looking bright for the helicopter industry as the U.S. Army is planning on purchasing 150 helicopters for their allies and ‘other government agencies,’ according to The Drive. The Army’s plan to is deliver 150 helicopters over a period of five years according to an announcement that the Army made on FedBizOpps, which is the federal government’s main website for contracting services. 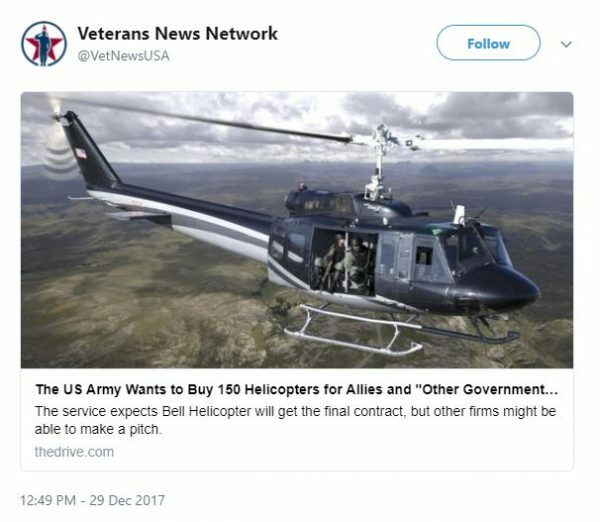 Traditionally, the Army has worked with Bell Helicopter to satisfy their needs, but they are required by law to give industry rivals a chance to make competing bids. While the Army has not specifically said where these new helicopters will be delivered, The Drive has made some predictions. One potential candidate for new helicopters is the Customs and Border Protection. The agency operates a large fleet of Huey IIs and will likely be needing more as President Donald Trump continues to focus on border security. Customs and Border Protection uses the Huey IIs to keep track of activity along the U.S. boundary with Mexico. In addition, some of the newly purchased helicopters will likely make their way to the State Department to replace their aging Hueys. Back in September of 2017, the Army signed a deal with MD Helicopters for $1.4 Billion to supply them with light attack helicopters for foreign governments. Some of the recipients from this purchase included Afghanistan, Kenya, and Lebanon. The Army’s announcement mentioned that their allies, which could include those countries will benefit from the purchase. Bell Helicopter’s Huey II is popular with the U.S. Army due to its reliability and flexibility. On Bell’s website, they advertise the Huey II as a ‘daily workhorse with an expansive cabin providing multi-mission flexibility.’ The helicopter has 220 square feet of cabin volume and can hold up to 4,873 pounds of cargo. When configured at its maximum passenger capacity, it can seat up to 14 people. The Huey family of helicopters has been in production since 1956. Other helicopter models that the Army may acquire in this potential deal include Bell’s 407GX, 412EPI, 429, and 505. While buying the new helicopters, the Army wants to purchase spare parts and other services. Bell Helicopter is the preferred helicopter vendor for the Army due to their long history of collaborating, but the branch will consider other offers until January of 2018.